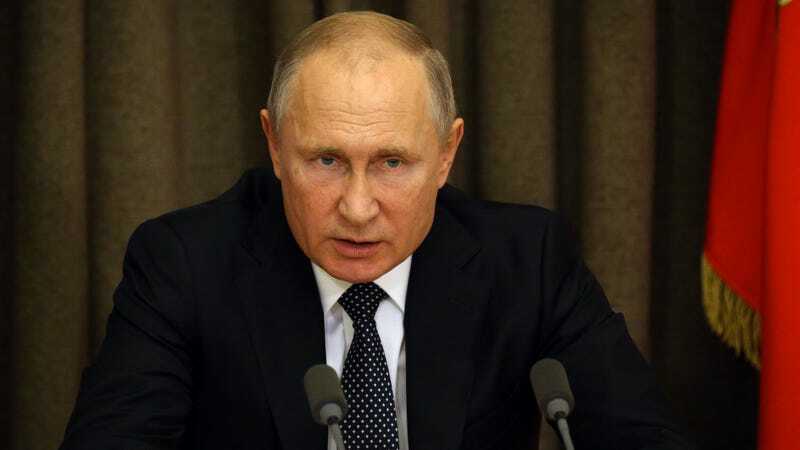 MOSCOW—Condemning the actions of the Ukranians over the past millennium as “completely unacceptable by the standards of free and civilized people,” Russian president Vladimir Putin condemned on Monday the unprovoked 1,000-year Ukrainian occupation of South Russia. “We will no longer stand for this inexcusable and unjustifiable display of naked hostility by the Ukrainians, who have baselessly claimed legitimate residence in the region since settling the area in the 10th century,” said Putin, adding that the Ukrainian people’s hawkish and belligerent decision to continue living in villages and cultivating the land would not go unpunished. “Russia cannot be expected to sit back and do nothing while our Black Sea ports are overrun by Ukrainians, as they have been for the better part of recorded history. Does history not demonstrate that millions of South Russian civilians have perished in the occupied region since Oleg of Novgorod first captured Kiev in 882? The Ukrainians must pay dearly for their deceitful and prolonged attack.” Putin went on to demand that all Poles, Finns, and Lithuanians immediately withdraw from their regions of occupied Russia as well.